Prince William is finally set to announce his long-awaited engagement to girlfriend Kate Middleton, according to speculation sweeping the UK. A high placed royal source has reportedly revealed two days in June - the 3rd and 4th - have been mysteriously blocked out on palace diaries. "They suggest this is a likely date for the engagement announcement at last," Princess Diana biographer Tina Brown reports on website the Daily Beast. The claim follows a weekend report that the Queen has placed a bulk order for champagne, fuelling speculation William has popped the question. An unexplained order had been made for 300 bottles of vintage Dom Perignon worth almost $50,000, the News of the World reported. "This usually only happens ahead of special occasions like weddings and family announcements. It suggests something big is coming up,& #39;& #39; a source told the paper. Plans were in place for the pair to wed before February 2012 celebrations to mark the Queen& #39;s diamond jubilee, or 60 years of rule, the paper added. If the latest hints are on the money, the engagement announcement would be timed to come after Britain& #39;s May 6 election and before William& #39;s planned first joint overseas tour with brother Harry. William is president of England& #39;s Football Association and the two princes are set to travel to Africa in June for a trip that will take in a soccer World Cup match. 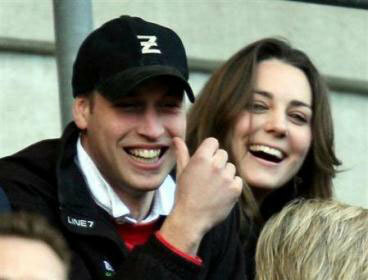 The rumours would see trainee helicopter rescue pilot William, 27, and Kate, 28, marry in the winter, possibly as early as November. That would see the couple conveniently tie the knot before Prince Philip& #39;s 90th birthday in June 2011. London also hosts the 2012 Olympics, potentially leaving William with a long wait for a suitable gap for his wedding if he does not act soon. The pair met when both were studying at St Andrews University and have been dating for over eight years, leading Middleton to be dubbed "Waity Katie". Past speculation of impending marriage has been off the mark, with UK department store chain Woolworths launching commemorative plates, mugs and tea towels as far back as 2006. The chain went bust without any confirmation of the royal wedding.